Elizabeth Phillips was pictured in the last issue of World of Cruising presenting a posy to Her Majesty the Queen after the christening of P&O Cruises’ Britannia. Now we find out more about the 23-year old who is the ship’s youngest deck officer. You are from the Isles of Scilly. Has the sea always been in your family’s blood? Going back several generations on my father’s side, my great-great grandfather was the Captain of a sailing ship and a lifeboat man in the RNLI. After growing up in the islands my father went to sea as a cadet, serving mainly onboard cargo ships. After eight years in the Merchant Navy, he continued to work on the sea running a passenger boat in and around the islands for the Boatman’s Association for 28 years. In addition to this he has been working part time as a local pilot since 1988, bringing in the ever-increasing number of passenger ships, landing craft, small coasters to the islands. What was life like growing up in an island community? I feel very fortunate to have grown up in a place like Scilly. With such a small population and isolated from the mainland, there is a very strong a community feel where everyone knows everyone. My sisters and I were given much more freedom to go out roam around, explore and play. As an adult working away, the community feel in the islands gives me a sense of belonging and security with people always asking my parents what part of the world I’m in or how my sisters are getting on. It’s a very comforting feeling that while I’m away Scilly will always be there for me to come back to. No matter where I end up in the world Scilly will always be home. At what stage did you decide that you wanted to pursue a career at sea? It was not until I was doing my A levels and told to make some concrete decisions about my future and what I wanted to do after school that I started to consider it as a career. I spoke to various people with backgrounds in the Merchant Navy and attended an open day to gain more information about the industry. What are the entry requirements for a Carnival UK cadetship? There are different academic levels at which you can start a cadetship depending on which route you would like to take. The entry process for Carnival UK involves an interview, tests and an assessed group communication exercise. 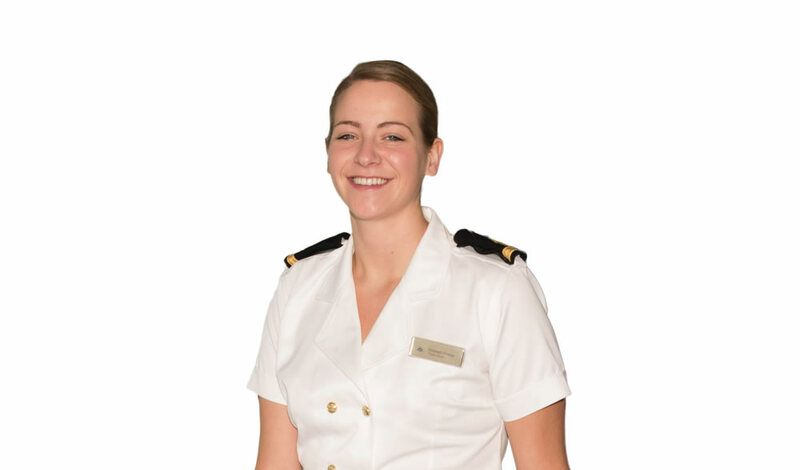 The cadetship is over a three-year period and is comprised of both college time at a nautical college learning all the theoretical knowledge of navigation, stability, cargo, meteorology and time at sea gaining practical experience on the company ships. The final assessment at the end of the three years is an oral examination with the maritime and coastguard agency. Everyone has to start at the bottom, so to speak. What was your least favourite job as a cadet? The phrase “its character building” wore pretty thin towards the end of the cadetship, this is usually what accompanies the less exciting, mundane tasks. As you already mentioned everyone has to work their way up, this is something that is particularly true with a career at sea as experience is everything. From a safety or management perspective if you are going to be dishing out these tasks, it is only right that you have the underlying knowledge of what it actually entails. How much training do you still have to do? At present I have my Officer of the Watch Unlimited Certificate of Competency and will shortly return to college to study and obtain my Chief Mate Unlimited. Following this I will need to accumulate another 18 months sea time before I am eligible to sit the final oral examination with the Martimie and Coastguard Agency to become qualified as a Master Mariner. What are your interests away from ships? I make the most of having long leave periods by spending part of my time catching up with friends and family at home, enjoying the chilled out relaxing pace of life in the islands. For part of my leave each year I try to go travelling to explore different cultures in different parts of the world. What was your reaction when you discovered you were to be posted to Britannia? I was excited to have the opportunity to experience the shipyard and looked forward to the challenges and learning curve that bringing a new ship into service would involve. What are your memories of the day of the christening, and your role in presenting a posy to The Queen? With all the final preparations for the naming ceremony and bringing the ship into service it was a very exciting and busy time. The memories that stand out include polishing our shoes on the bridge the morning of the ceremony, watching and cheering as the champagne bottle smashed against the ship’s side, lining up with the other deck officers as we greeted the Queen and of course presenting Her Majesty with the posy. Favourite aspect of life at sea? Watching the sun rise over a different horizon every day, and looking forward to the experiences, challenges and variety that the day will bring. Saying goodbye to family and friends at the start of a three-month contract. Favourite destination around the world? The most beautiful places include the Norwegian fjords with the most stunning scenery. Cabo San Lucas in Mexico and the west coast of America is where I’ve seen the most wildlife including whales, sea turtles and sea birds. The best beaches would probably be between the Bahamas and the Cayman islands.